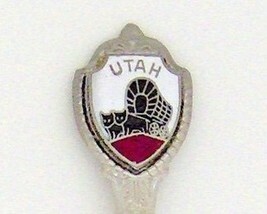 This souvenir spoon is from the state of Utah. It is about 3-3/8" long with a cloisonne emblem depicting a covered wagon being drawn by oxen. The 11/16" bowl is plain. 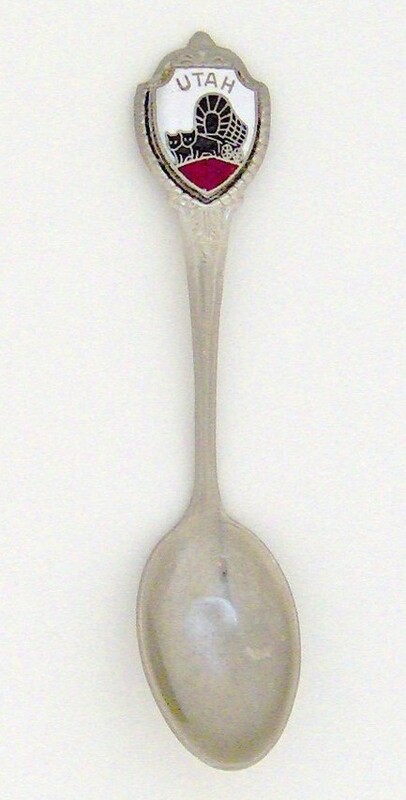 ******************************************************************* This spoon is one of more than 150 that I inherited from a friend. She travelled extensively in the 60's, 70's and 80's. Many of her friends also contributed. I am not a collector and what little knowledge I have has been gleaned from the internet. As far as I can tell, the spoons are all in good condition, except as noted. They were gently cleaned recently -I didn't want to hurt them. Measurements are my best attempt and may be off slightly. This is in no way intentional.